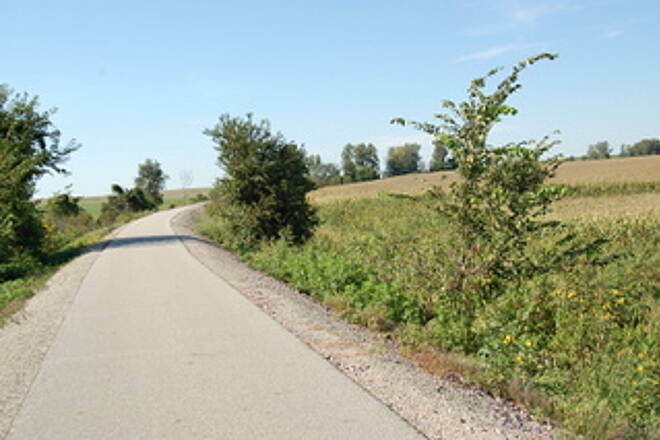 The paved Chichaqua Valley Trail crosses 27 miles of central Iowa farmland between the northeastern Des Moines suburbs and the rural community of Baxter. 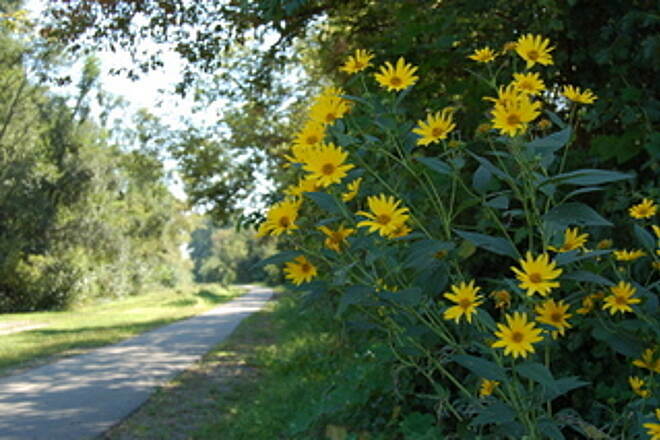 The trail’s name, pronounced chee-chak-wah, is derived from a Native American word. Pioneers mistook it to mean skunk, but actually it refers to the aroma of wild onions that grew along the Skunk River, which the trail spans. 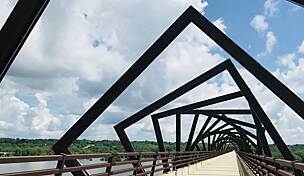 The trail follows the original route of the Wisconsin, Iowa & Nebraska Railroad, built in 1885. Other railroads to subsequently use the corridor include the Chicago, St. Paul, & Kansas City Railroad (1886–1892), the Chicago Great Western Company (1892–1968), and the Chicago & Northwestern Railroad Company (1968–1984). 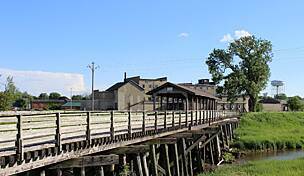 Abandoned in 1984, the route became one of Iowa’s first rail-trail conversions in 1987. 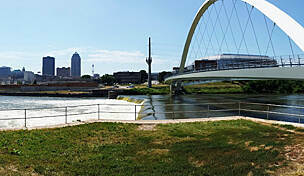 A 6-mile extension ushered the trail into Des Moines in 2015. Although the trail is paved, the inconsistent surfaces at the eastern end of the trail make for rough traveling between Baxter and Mingo. 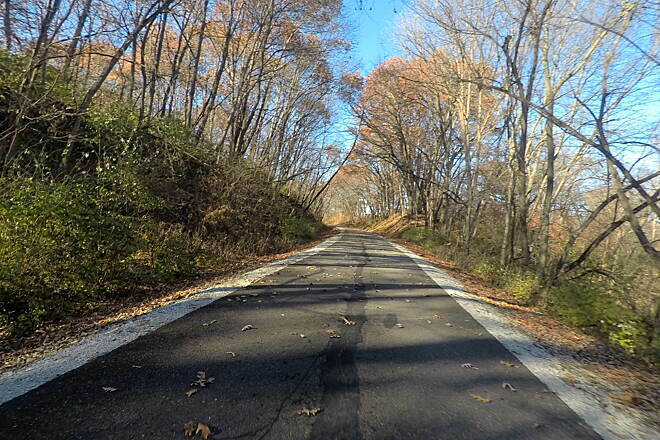 The trail surface is much smoother and trailside services are more frequent west of Mingo. The trail crosses gravel roads every few miles, but the crossings are easy, and for most of the trail there is no noise but the wind rushing past. You can gauge your progress by watching for old railroad mile markers that show the distance to Kansas City. Beginning at Mally’s Weh-Weh-Neh-Kee Park (meaning “good place”) in the former coal-mining community of Berwick, the junction with the Gay Lea Wilson Trail is 0.8 mile to the west and the trail end is 0.3 mile beyond that. Heading east, you’ll leave behind suburban sprawl and pass farms before arriving at Bondurant in about 5 miles. The town completed the trailhead park, featuring a replica train depot for restrooms and drinking water, in 2013. 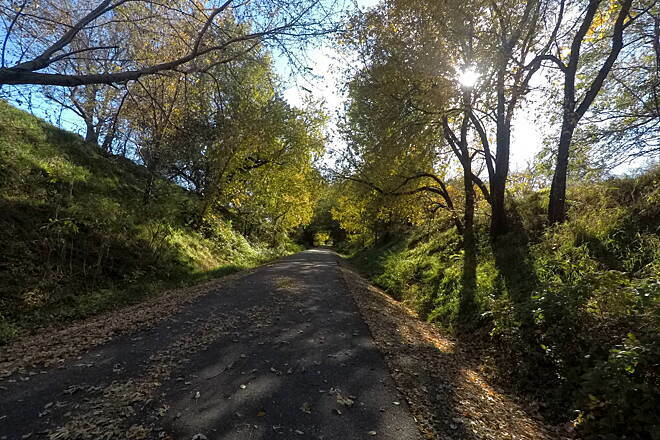 You might spot wildlife and wildflowers as the curvy route passes through the Santiago Creek greenbelt east of town. 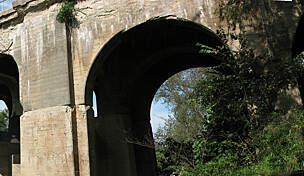 In about 7 miles you’ll cross the Skunk River railroad bridge that dates to 1885 and enter the Chichaqua Wildlife Management Area. 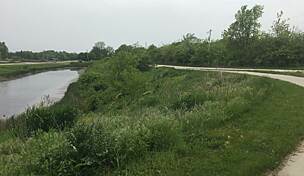 The trail takes a serpentine course through the creek drainages and river valleys that is uncharacteristic of the straight routes charted by many Midwestern rail-trails. The next three small towns—Valeria, Mingo, and Ira—don’t offer much in the way of food or refreshments over the next 15 miles. Arriving at the end of the trail in Baxter, you’ll be greeted by a restored 1913 wooden caboose that also contains historical displays and restrooms. Baxter offers cafés, taverns, and markets to replenish weary travelers. To reach the southwestern trailhead at Mally’s Weh-Weh-Neh-Kee Park from I-35, take Exit 89, and go east on Corporate Woods Drive toward the driver’s license center. Go 0.8 mile, and continue on the road as it becomes SE 72nd St./NE 62nd Ave. Go 0.9 mile, and turn right onto NE Berwick Drive/County Road F52. Go 0.5 mile, and turn right into Mally’s Park. Go about 200 feet, and find parking on the left. Follow the path heading northwest to the trail from the parking lot. 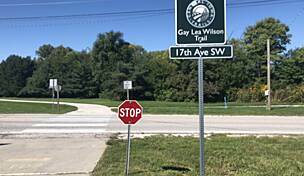 The endpoint is located 1.2 miles southwest at NE 29th St.
To reach the northeastern trailhead from I-80, take Exit 149, and go north on NE 112th St./County Road S27. Go 5.8 miles, and turn right onto US 65/SR 330. Go 5.9 miles, and turn right onto County Road F17 W. Go 7.2 miles, and turn left onto Southwest Ave.; then go 0.4 mile, and turn right onto W. State St. Go 0.1 mile, and look for parking on the left. Just finished riding the Chichaqua Valley Trail. Even though the temperature today was 100 degrees, I really enjoyed the trail. 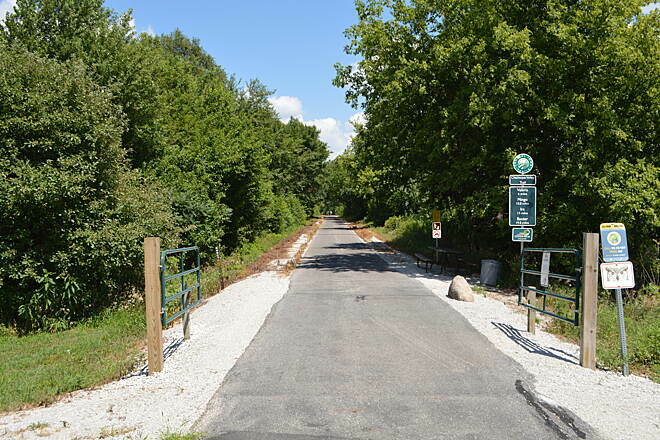 The trail surface is paved and easy to ride on. I found no bad areas of the trail and the tree coverage of the majority of the trail length makes for comfortable riding. Several nice small bars to stop at to refresh in the pass through towns. 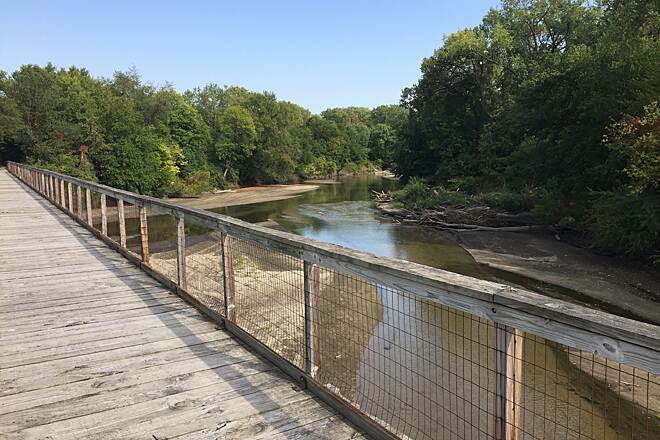 I was pleased to hear that the trail will be the location of the Pedalers Jamboree Iowa music festival on August 26 and 27. Should be a great time! I will be back. We had a great ride from Berwick to Baxter. We were pleasantly surprised to find the awful coated surface east of Mingo had been replaced with a new layer of asphalt!! This was done after we rode the trail last July (2016). It just made the whole ride so enjoyable and we have now added this to our "favorite --gotta do" list when we are in the Des Moines area. The improvements are greatly appreciated!! 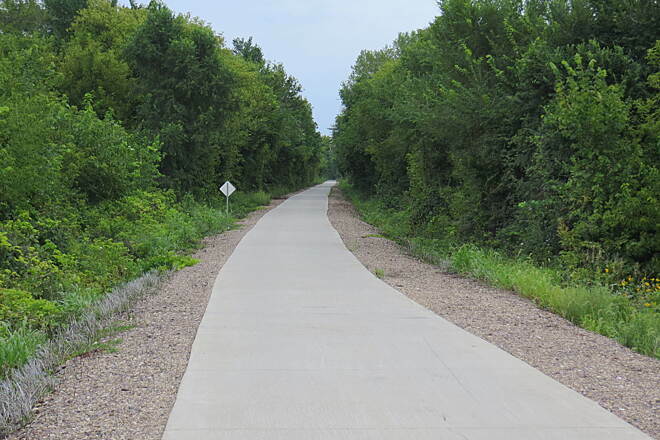 The 3.7 mile section of the trail that was pulverized and seal coated in 2013 received a new asphalt surface in October of 2016. We loved this trail. Like others said, there is a part east of Mingo that is in poorer condition, however, we parked at the trailhead in Bondurant which is phenomenal. Rode to Mingo and back giving us 30 miles. Had lunch in Bondurant at Founders Irish Pub which was great with outdoor seating. After lunch we rode west for 6 miles, it then connects to two other trails. It is in excellent condition. Much of it is concrete. Back in Bondurant is a new Brewery named Reclaimed Rails with a great selection of craft beers for after a long ride. Highly recommended! However, last nite I rode the trail from Bondurant to Baxter. After passing thru Mingo the trail became awful. The surface looks and feels like they poured oiled on it, and then sharp shards of crushed white rock. It is wavy, bumpy and absolutely horrible on your tires and wheels. If someone were to lay their bike down, the road rash would look like someone took hundreds of shards of glass and ran them over your body. This goes on for about 4 – 5 miles until you pass IRA. 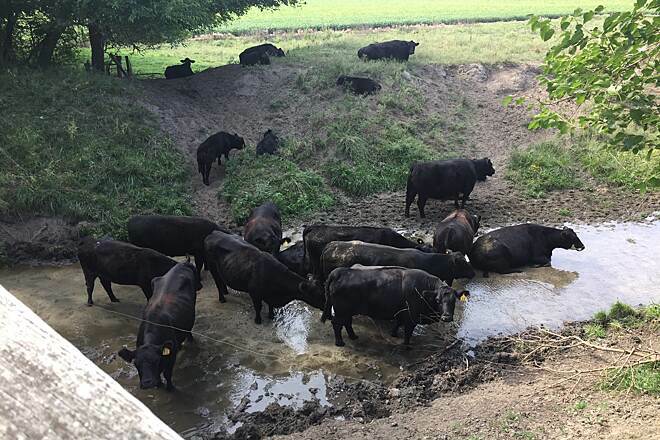 What is sad is that the bartender in Baxter claims that Jasper County was granted funds to fix it and this is what they did. Now they claimed they were going to resurface it this spring. But, didn’t. Between Bondurant and Mingo I came upon many people riding bikes. From Mingo to Baxter, about 10 miles, I did not come upon any people riding bikes. We are rookies in our 60's, trying to increase our mileage. We started our morning parked at the Bondurant depot, hoping to get all the way to Baxter. Morning temp was about 66 with slight breeze blowing. 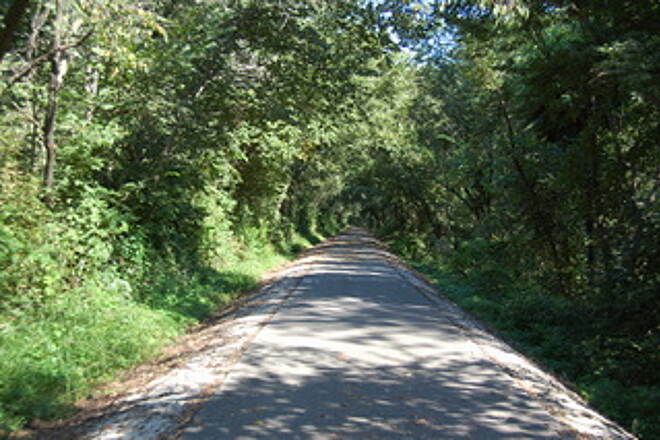 A few miles east of Bondurant, we began the long winding gentle slope down to the Skunk river- all great pavement, and mostly in shade. After the Skunk river, pavement quality deteriorates a little and eventually becomes packed gravel, but still OK for my road bike. A slight incline toward Valeria (past which there is a beautiful grove of big cottonwood trees right next to the trail). Then down somewhat to Mingo where there is a nice pavilion and bathroom right by the trail. More open and some poorer quality surface as you get further east, but there are nice views of Iowa farmland. The long gentle grade up to Baxter has better pavement and more shade. Trail ends at the caboose in Baxter. Temp was 87 when we arrived in Baxter, we had quite an appetite so we went to the Blue Ribbon café, on the highway at south end of town (actually just up the hill on the highway from the trail). Café is open 7 days, you might check on their hours before going there. We took a brief rest, then headed back. Return trip that afternoon was in slightly warmer conditions but we had plenty of water and snacks. The grade coming back into Bondurant is easier than we thought it would be. Trail is well maintained, and well used. We saw all kinds of bikes on the trail- kids, fat tires, and speedsters with their Tour de France lightweights. Had a great time on the trail; we made the 46 mile round trip in 6.5 hours including all stops. Keep in mind there are no services on the trail between Bondurant and Baxter. This is a trail review for in-line skaters. 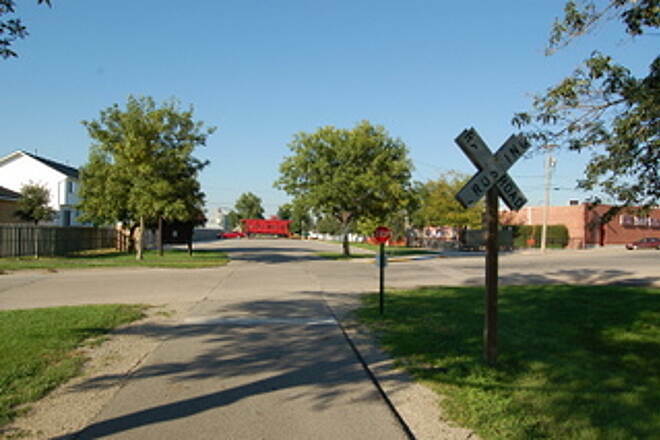 The Train Depot in Bondurant has a decorative cobblestone section on the both sides of the trail on either side of an intersection which is impossible for in-line skaters (roller bladers) to skate across, as are the rumble/warning strips at many trail intersections. We have to walk in our skates across the grass which is challenging. It would be helpful to have a narrow strip of pavement on one or both sides of the cobblestone or rumble strips for skaters. The trail is not accessible for skaters if parking in Mally's Park in Berwick. We considered parking in the city of Berwick and skating on the road to get to the trail, but ended up driving to Sargent Park in Des Moines which has parking and easy access to the trail for skaters. The new trail between Sargent Park and Bondurant is very nice for skaters. We started at the most southern trail head just outside of Bondurant. Nice parking with a KYBO. The trail is in great shape for 11.5 miles where it turns to chipped rock surface. It appears the blacktop was in poor shape. Instead of resurfacing it they reconditioned it with oil then chipped rock. This runs for 4.5 miles where it turns back into a very nice trail. From here it is 4 miles to Baxter. 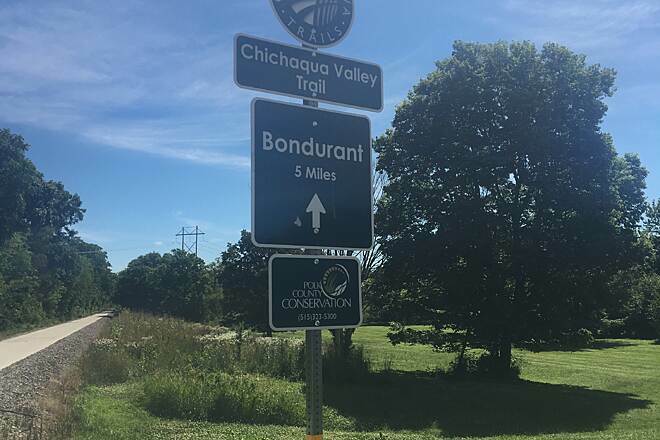 If you want a 23 mile ride on a road bike start in Bondurant and turn around where the rock starts. The rock section isn't loose rock yet I would not ride a road bike on it. Leaving from Baxter there are signs warning you that the trail surface is dangerous, and they aren't kidding. The asphalt is way past its prime, now marred by cracks, holes and uneven patches. Four miles out of Baxter the trail surface becomes crushed rock, at which point I turned around. This was once a great trail, now it should be repaved or closed. we usually ride the 330/30 , lynn creek trail from melbourne to riverview park in marshalltown, but decided to venture out of town. 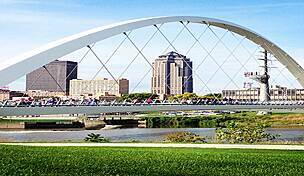 can only say it was awesome and now every time my wife wants to go shopping in des moines she can drop me off there. i loved it, and won't hesitate to do it again. thanks to all those responsible for this wonderful trail. Wow, this trail was a real surprise. I picked it up Northeast of Bondurant in Valeria which is not really much of a town to speak of, but the trail is clearly marked when coming off of Hwy F34/NE 94th Ave. The section that is closed from Bondurant to Valeria is gated off.... The scenery all the way to Baxter was as serene as it gets for the Midwest. Supposedly there is a place to get water in Mingo along the way.. I did not find it... Baxter has a small grocery store and a restaurant or two to kick back at. Can't miss the big red caboose at the end of the trail in Baxter which denotes the trail head. 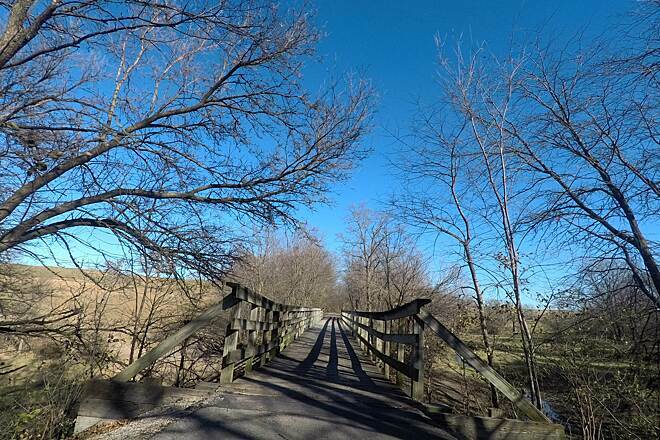 Wood bridges along the way are in ok shape. I chose to walk my bike across them to prevent a splinter flat... Great ride overall! 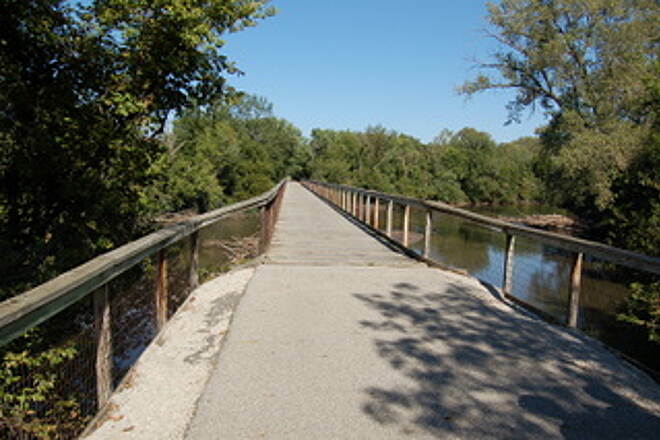 Due to flooding, the trail is closed at the south trailhead outside Bondurant all the way to Valeria until fall of 2012. Floods washed out the trail in several areas and the bridge across the Skunk River. Repairs will hopefully be completed in the fall in time for the leaves to turn color. After riding this trail I said to myself "What is it doing here?" 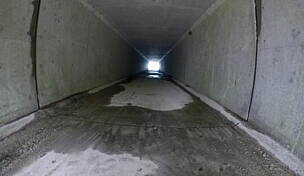 It is surprising as far away from things the trail is that someone would even think to put it where it is. The trail is an old railroad, so the hills are not very hilly, but when you ride the trail you know why is is called valley... you go down, then up. The 'towns' along the way are puny and I saw only a handful of people, but they all waved and said 'hello'. I passed only a handful of other bikes. If you really want to get away from things and go off by yourself, this is your trail. Make sure you pay attention before you go where the trailhead is, it is not in a logical, easy place to find. Even though it was early (mid March) the weather was warm & the trail was nearly snow & ice free. The southwestern trailhead was a little hard to find driving east through Bondurant--some signs would have been nice. The Baxter end was the most scenic with the rolling hills & marshland. 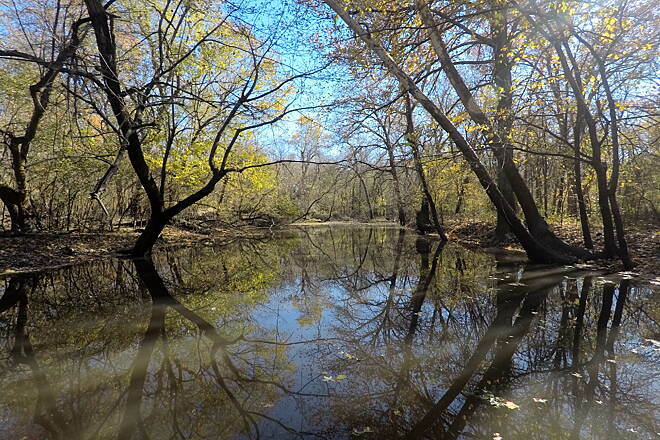 It was surprising to find this undeveloped area so close to Des Moines. The small towns didn't have much to offer as far as convenience stores or rest rooms, so pack your own food & water. There was a dog bite report from a little east of Mingo although I didn't get chased; so be on the lookout.
" I sent some pictures of this trail over the weekend. One was about the red caboose at the end of the line. If you could add explanation that caboose is in the village of Bailey, the northernmost point & trailhead on the Chichaqua, it would be appreciated. Also, if the pictures are too small, I can reduce image quality and then they will be larger. Let me know. Thanks Rick Wagner"
" Rode this trail on Sept. 3, 2007. Very typical scenery of midwest, crops, livestock, flowers, and lovely hills. I am one who appreciates the engineering of these railroad corridors, how they go around the steepest hills with a gentle grade..
Hope you like the pictures. Trail surface has potholes, and one large bridge has loose boards. Flowers were gorgeous on Labor Day, 2007. " 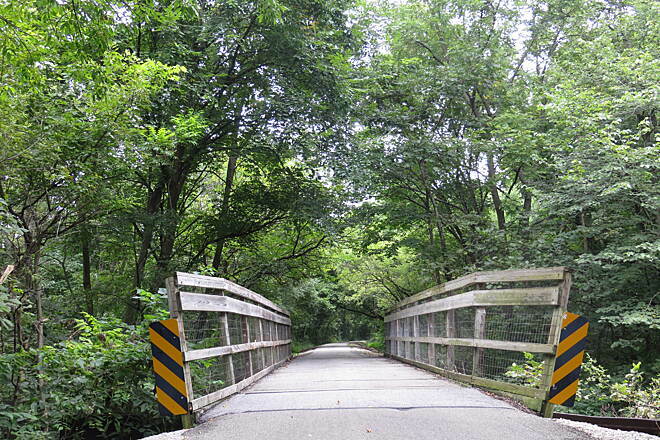 "This is one of the most scenic and underutilized trails near Des Moines. It is almost exactly 20 miles from one end to the other. There are several picnic areas including benches and porta potties along the way, bridges, and it ends in Baxter at an old red caboose. The previous review said something about a gravel approach to the trailhead. I don't know what they were talking about. 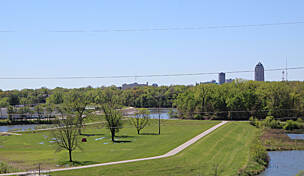 There's a nice paved parking area at the Bondurant trailhead (off Route 65 - look for the signs) as well as in Baxter." 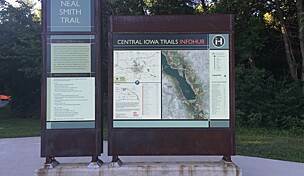 "This is a pretty decent 20 mile trail about 15 miles NE of Des Moines. 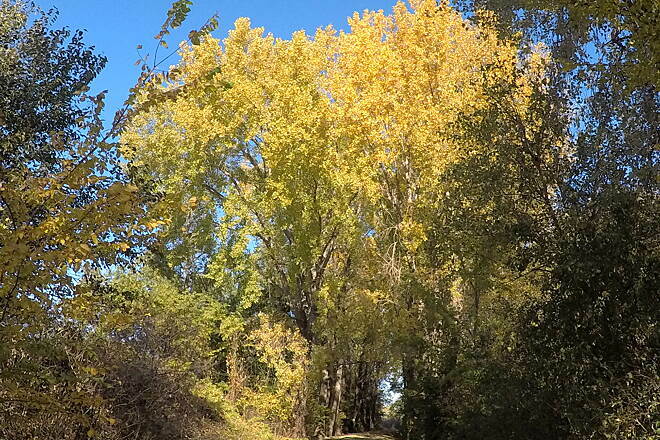 The SW trailhead is a couple miles outside of the town of Bondurant. It's a little inconvenient to get to if you're on your bike, because it's off the main road and you must ride about 1/3 mile of gravel to reach the trailhead. 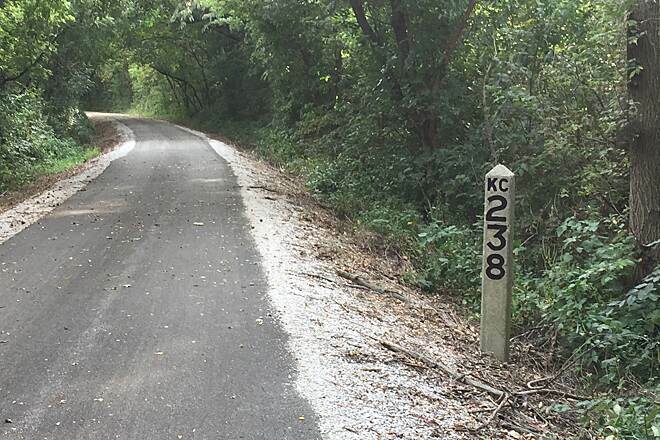 Once on the trail (and assuming you're reading SW-NE), it's about 10 miles of paved 4% grade to the town of Mingo and another 10 miles of paved trail to Baxter. In Mingo, there's a friendly little watering hole where the locals are friendly and the beer is cheap and cold. There are two taverns in Baxter, one of which was extensively remodeled in 2000 and is very nice. The trail used to be crushed limestone, but was paved in 1999 -- so traffic has increased somewhat. 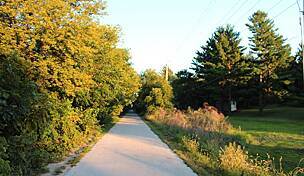 The trail offers a nice mix of scenery -- rolling farmland and woods along the Skunk River. There are a few park benches that offer decent opportunities for impromptu picnics. 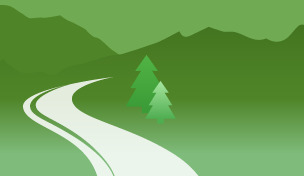 Out of five stars, I'd probably give this about a three -- primarily because the trail head is not conveniently located."